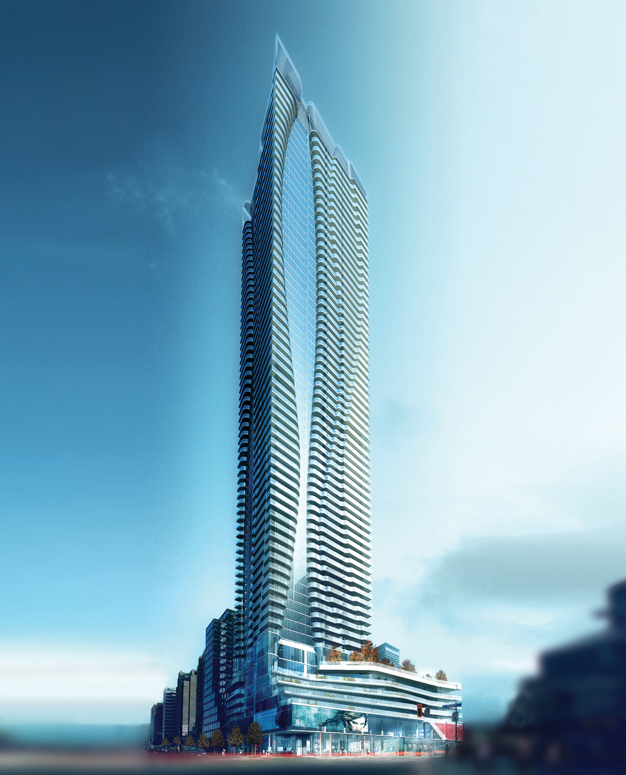 This world class residential condominium, with retail spaces on the first and second levels, is located at the south-east corner of Yonge and Bloor Streets close to Toronto’s fashionable shopping district. The entire complex is constructed above six levels of subgrade parking. The podium, rising from street level, contains retail, commercial, residential, and amenities spaces. The levels are clearly defined by the stepping back of the terraces on the Yonge Street elevation. The furthest step back at the seventh floor defines the west limit of the landscaped roof terraces and amenity area, below the tower. At grade level, in the south-east corner of the podium, there is an eleven metre diameter specially designed depression to accommodate a turntable to facilitate commercial trucks in entering and leaving the truck loading area from Hayden Street. From the ground floor up to the eighth floor, there is a central reinforced concrete core within a reinforced concrete core, with the outer core being carried on ten columns which extend down through the six parking levels on to a reinforced concrete mat footing, below which caissons were added to deal with the soil pressures and settlements below the mat. The specially reinforced central concrete core configurations interact with the surrounding shear walls to resist lateral forces resulting from wind and seismic affects. Special damper tanks, containing water, are located at the high roof level, above the seventy-first storey mechanical level and are designed to control lateral accelerations resulting from wind forces. The tower envelope consists of a curtain wall system. The limits of the ends of the residential unit balconies step back and forth to present an undulating sculptured affect on the tower’s facades, which is made more dramatic by the aluminium handrails and the tempered glass of the balconies’ balustrades.